The Global Volcanism Program has no activity reports for Nemo Peak. The Global Volcanism Program has no Weekly Reports available for Nemo Peak. The Global Volcanism Program has no Bulletin Reports available for Nemo Peak. 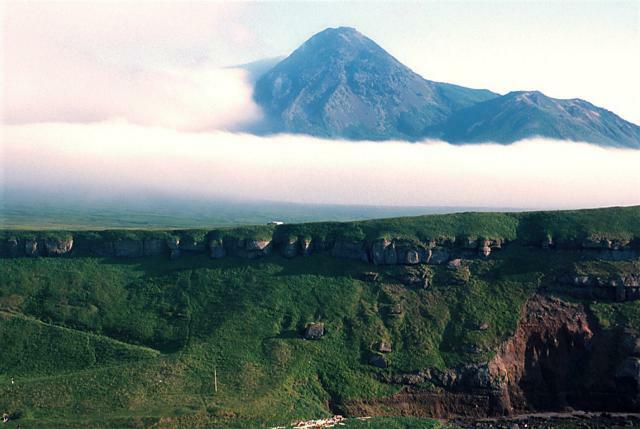 Nemo Peak volcano at the northern end of Onekotan Island in the northern Kuriles is truncated by two nested calderas of preglacial age, the largest of which is 10 km in diameter and extends to the northern coast. A third 5-km-wide caldera formed about 25,000 years ago by collapse of an interglacial cone that was constructed over the glaciated surfaces of the earlier calderas. The 1018-m-high central cone of Nemo Peak is composed of two coalescing andesitic cones that were constructed at the SW side of the youngest caldera and formed in four stages beginning in the early Holocene about 9500 years ago. Construction of the central cone has left the crescent-shaped Chernoe Lake at the NE end of the youngest caldera; lava flows from Nemo Peak form the broad SW shoreline of the lake. The final activity built a lava dome that completely overtops a 350-m-wide crater and has a 150-m-wide crater at its summit. Historical eruptions of Nemo Peak date back to the early-18th century. Melekestsev I V, Braitseva O A, Kiryanov V Y, 1990. History of eruptive activity and predicting impending eruptions of the peak Nemo volcano on the Onekotan Island, Kuriles. IAVCEI 1993 Internatl Volc Cong, Mainz, Abs, (unpaginated). Melekestsev I V, Volynets O N, Antonov A Y, 1997. Nemo III caldera (Onekotan I., the northern Kuriles): Structure, 14C age, dynamics of the caldera-forming eruption, evolution of juvenile products. Volc Seism, 19: 41-64 (English translation). There is no Deformation History data available for Nemo Peak. There is no Emissions History data available for Nemo Peak. Steep-sided Nemo Peak, seen here from the south, is the northernmost of two large volcanoes forming Onekotan Island. The 1018-m-high compound central cone of Nemo Peak formed in four stages beginning in the early Holocene. Construction of the cone within the youngest of three large calderas has left a crescent-shaped lake at the NE end of this 5-km-wide caldera. The final activity built a lava dome in the 350-m-wide summit crater. Historical eruptions of Nemo Peak date back to the early-18th century. There are no samples for Nemo Peak in the Smithsonian's NMNH Department of Mineral Sciences Rock and Ore collection. Large Eruptions of Nemo Peak Information about large Quaternary eruptions (VEI >= 4) is cataloged in the Large Magnitude Explosive Volcanic Eruptions (LaMEVE) database of the Volcano Global Risk Identification and Analysis Project (VOGRIPA).